East North is a super shallow site great for learner divers and can be full of a bit of everything. Protected from any southerly swell but open to windy conditions this site is great for beginner divers or anyone who wants a nice gentle dive. Often the sandy bottomed areas have plenty of sea stars and maybe some rays, an easy 20-40 ft rock edge which slopes off to 60 ft towards the north point of the main island. Look between boulders for baby sharks and seahorses. 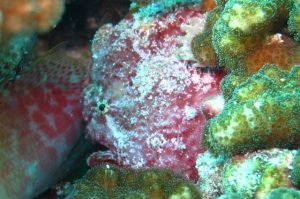 Frogfish have been seen at this site along with harlequin shrimp. Marine life that are commonly seen at these sites include eagle rays, round rays, moray eels, octopus, schools of grunts, harlequin shrimp and maybe a seahorse.